Reviews | #70 Round Squeeze Handle Disher Portion Scoop - .5 oz. #70 Round Squeeze Handle Disher Portion Scoop - .5 oz. Constructed entirely of 18-8 stainless steel, this 1/2 oz. #70 round disher is perfect for making chocolate truffles and other bite-size confectioneries. It features a squeeze handle design that allows for use of your whole hand instead of just your thumb to activate the blade. This cuts down on fatigue with extended periods of use. The blade extends beyond the bowl to prevent sticking and it is for use with either your left or right hand. Best for softer foods and low volume use. The were absolute junk! The sweeper inside the scoop what an 1/8" gap between it and the scoop bowl. The first time i used the scoop the gears slipped and the sweeper popped out. I WOULD NOT recommend these if you are scooping anything with any density to it. VERY DISAPPOINTED!! Thank you for the review Rebecca Burns. We’re sorry this has not worked well for you. This item is a great value, for recommendations please contact our Customer Solutions team! I have to give this product only 1 star. It's not durable and broke within the 1st few days of use. We are a high volume restaurant, so maybe it's not meant for high volume usage. I would not recommend this product. This disher is great! Very sturdy, and I’ve used it for many purposes, including cupcakes, cookies, truffles, and even potato cakes! Great product! Five stars! Great product - we use this to portion out ricotta for our cheese tasting classes. It's a well made tool and was a good buy! This is a perfect size for "mini" meatballs. IT allows for quick CONSISTENT portions, which is appreciated by everyone. Quality seems to be standard, and have had no issues. This #70 disher is made of stainless steel and works well. The only downside is the blade does not travel as close to the bowl as some other more expensive dishers, so not 100% of the contents are pushed out. Overall it works great though, and it is priced less than half of the other brands. I like this type of scoop because it releases well and having the trigger on the end versus the side is a big deal. Easy to clean. I use these every week several times a week, but I have found that with a heavier cookie dough the swiper will click out of position causing you to have to manually force it to click back into the correct position. Otherwise it works great for portioning out cake batter etc. This scoop is the perfect size for portion control. You can make your batches stretch further by using this scoop, but it’s still a decent portion when using it for cookies. Make sure you wash this immediately after use for ease of cleaning. A must have for portion control and consistency. I have gone though some other brands in the past pretty quickly, but the gears haven’t slipped once on this one. These little scoopers are perfect for portioning out small amounts of sauces, sour cream and salads dressings. They are easy to clean and such a great deal! These little scoopers work great and i believe they are the smallest portion size you can get. When are the going to make tablespoon scoopers!? These scoops are sturdy, easy to use, and well made. I love them so much I'm working on getting one in every size! Best of all they cost half as much as my local store. We love these little scoopers. They are perfect for scooping butter and sour cream into baked potatoes or ramekins. We would recommend to others and will continues to buy. This is a perfectly functional disher, though the Vollrath outperforms this is handling, quite literally. The mechanism on this is kind of sticky, so you have to use some hand muscle to use it. The angle of the handle also tends to put all the pressure onto one spot of your palm. This is not going to be the most comfortable scoop in the world for large batch work. It did handle a peanut butter cookie dough pretty well. It doesn’t seem to release the dough quickly, so I tend to squeeze multiple times to get it to release faster. This size makes a really nice, smallish-standard cookie. I’ll keep it in my arsenal, but if it breaks, I’ll replace with one of the better dishers, like the Vollrath. These are ok. I bought one to replace one i already had that it seemed to be made cheaply, and i thought this one looked heavier duty but it broke after 2 weeks. We appreciate your review, Laura! We are sorry this scoop did not meet your expectations. Please read our Q&A about which scoop to use for your operation. If you have any questions, please contact our Customer Solutions team. I did love these scoopers but they have now started to fall apart. Next purchase will defitintely be something a bit more substantial to hold up to the usage. Not a huge fan of big thick cookies. This scoop is the perfect size for portioning out cookie dough. Also good for making melon balls, if you don't have an actual melon baller. Perfect for scooping cookie dough portions. We also use it for sour cream and guacamole. No issues with product sticking inside and it is easy to clean. Also, no issues with the spring action coming off the track, which we have experience with other similar models. I love this portion scoop! I use it all the time to make melon balls, or mini cookies. This little utensil is such a saver of time! I have used this for several months and it can be used extensively with no wear and tear on the scoop. It doesn't hurt your hands, even after a lot of daily use. I really like this little portion scoop for topping individual items like my German chocolate brownies. It is also great for portioning fillings for sandwich cookies. This scoop is comfortable to use it's great for getting cookies out in a hurry. I have quite a few of these & this one doesn't hurt my hand after scooping for long periods of time. I really was looking for a smaller scoop to use when I make candy so it's not the size I wanted, but I am still glad I got it. I bought one from another company that will remain unnamed and it kept sticking and getting off track. I have used this scoop to scoop more than a thousand portion sizes and it has never gotten off track. Used daily for almost 9 months now and still works great, cleans up nice and showing no signs of wear and tear. Highly recommended for any kitchen. We use this little gem all the time. We use it for butter, hush puppies, meat balls, ice cream (only when we are on a diet) and more! This scooper jumped the track once - we believe it was our body-building prep cook) but with some pliers we were able to get it "back on track!" keep several on hand because butter balling is fun for everyone! This is a great little disher for scooping bon bons or mini brownie or blondie batters into molds for baking. I use these for mini black bottoms as well. Another round squeeze handle Disher portion school. The .5 ounce comes in very handy in a restaurant. It's used on a daily basis and no doubt will last us a long time dude with every crafted material and durable design. Great disher for portioning cookie dough. This size scoop makes a nice sized cookie. I like the squeeze handle type of disher since my hands have arthritis and this is easy to use. These are perfect sizes for cakeballs and cakepops , even mini cookies ! They truly make the perfect sizero. I would strongly recommend if looking for cakeballs scoop. I bought this to use for scooping soynut butter when the scoop we were using broke. This scoop was definitely easier to use,although scooping soynut butter is definitely challenging. I'm sure there'd be no problem using the scoop for something softer. Nice size for someone who loves to bake. Our daughter wanted this so she could portion cookies and other baked goods she enjoys making. Need another one for our house. I agree with other reviews. I've used to portion cookie dough , soft butter, and the like. scoop falls apart. When it comes to portioning scoops, I feel that you get what you pay for. Spend a little more money and get something heavy duty. Thank you for the review, Jeremy! We do wish that this scoop would have worked better for you. For a a more heavy-duty option, try this Vollrath 47403 Plum #70 Squeeze Disher Portion Scoop! Has turned out to be excellent use for the meat at our all you could eat taco bar. Most people tend to not over portion when this is in use. I reallt like this scoop formy cookies. I think it gives the perfect size for them. I gave it a 4 instead of 5 stars because of how stiff the scoop is and I wish it scooped all the dough from the bottom of the scoop. This is your standard scoop. It works well, but can tire out my hand if I have to use it for prolonged periods of time. These scoops come in handy for so many different things but I use it to scoop cookie dough. It comes in many sizes which is great. This thing worked like a gem for about two weeks and then went rapidly down hill after that. It was use only for truffles and sadly did not preform well. The blade kept getting stuck and quit working totally within three weeks. Sad really because we loved it in the beginning. Thanks for reviewing this scoop, Nathanael! We're sorry it didn't work well for you. We recommend this Vollrath 47403 Plum #70 Squeeze Disher Portion Scoop instead! If you have not used a squeeze handle (like I hadn't before) then you don't know what you are missing. I always had issues with my extremely small hands being able to press the thumb lever on other styles. This one is extremely simple and doesn't cause hand cramps! This is the perfect size to dip batter for mini-cupcakes. Batter comes out nicely for even baking. The handle fits your hand great. it don't get tired . The scope works great when portioning out peanut butter balls. I love that the scope comes in so many different sizes. Will definitely be ordering more sizes! All of my cooking baking has been maker 10 times easier with the use of this scoop. It is very durable and not too heavy. Great scoop for butter or sour cream. All around durable and resistant material . Good to use for portion control. Easy to handle and keep clean. I really liked the size of this scoop; it was great for truffles and mini cupcakes. It worked well, but sometimes food would get stuck behind the little scraper. It didn't need much pressure to release the food, and it wasn't noticeably comfortable or uncomfortable. I speak in the past tense because it was dropped and broke apart. I don't blame it for breaking, but I don't know if another one would have survived the drop. Sturdy disher size #70. Purchasing this from webstaurant store was awesome. They ship very quickly and was in good condition. I love these for portioning cookie doughs! Over the past month, I have tried 3 times to fill out a return for this item, but the website keeps locking up. The scoop in basically non-functional. The Blade clicks for correctly when you squeeze the handle. BUT - when you release the handle, the blade does not click back into its beginning position. I have ordered from Webstaurant before, and recommended the company to other vendors. Every product I previously purchased was great, but this one is disappointing. Thank you for the review! We're sorry this disher was not the best option for you. A Customer Solutions Representative will contact you shortly. Good size for peanut butter balls. This size allows a decent amount of filling but makes them small enough to proportionally enjoy after being dipped in chocolate. feels good in your hand works effortlessly and smooth as you scoop and transfer items from container to your baking sheets. works great for smaller cookies. Thank you for the review, Suzanne. We are sorry to hear that this broke so quickly. A Customer Solutions Representative will contact you soon to credit you for the broken disher. "best used for soft foods or low volume" translates to will break with in a couple weeks. I bought 3 and they are all broken. Might work for a home cook that uses them for Christmas cookies and puts them away. Thank you for your review, Ben. We are sorry you did not like this disher. For use in a higher volume restaurant, we recommend trying this Zeroll 2070 Plum #70 Universal EZ Disher Portion Scoop instead. This squeeze handle is a great quality. We use it for cookies and they look great and are all the same size, plus the time you save by preparing them with this tool is awesome. Will buy in different size, highly recommended. We ordered 2 of these scoops a few weeks ago. One works great, the other is now useless. The first time we tried to use it the gear slipped out of place. It appears that the gear has too much slack and slips out of place under any kind of pressure. The other scoop works fine so I give 3 stars. One is great, one is gone. Thank you for your review, Ben! We are sorry this disher broke so quickly. A Customer Solutions Representative will contact you soon to credit you for the faulty item. this item works great, we use it constantly for things like almond butter, fresh watermelon, and many other things. squeeze handle extracts whatever youre scooping with ease. These are the perfect size to dip batter for mini-muffins. This will also be good for scooping melons this summer. It appears to be well made and I look forward to using more often. Fast, efficient way to scoop out mini cupcakes. Batters eject well, the scoop is easily cleaned, and strong enough to handle muffin batters as well. I use this for savory cooking, baking, and ice cream, of course. It is a perfect size scooper for portioning off cookie dough, and it also helps me make meat balls. It is a very versatile and sturdy product. I highly recommend it. This is the perfect size for mini cupcakes. It was perfect and didn't overflow. I would recommend this to any baker looking for the perfect portion! We use these scoops when making our truffles for ammenities and they are great! The scoop glides through prep and doesn't do a lot of damage to the wrist. I have arthritis, so I now prefer this over the thumb scoops! This is our most used disher scoop size. It's prefect for dishing out cookies for nice uniform sizes. It's also great for making meatballs too. This I must say is "the best buy". I bought this over a year ago and have used it several times to scoop out cookie dough, ice cream and portion meatballs and it still looks very strong. I only wish I had found it earlier. Handy for light-duty use light scooping our soft, sugar-based body scrubs for photo and displays. So many kitchen product transfer so well to the bath and body biz! This is smaller than i expected, although that might be my fault for not double checking my self. i use this to measure fillings for my bread and it turns out to be just the perfect size anyway! Great scoop for portioning out cookie dough balls, cake pops etc. The product is superior to what I have found in "big box" discount stores. I will continue to add to my collection of sizes through webstaurant store. Can't beat the price for the quality. The blade holds up well to stiff cookie dough. We use these at our church fair bake shop for cookie recipes which specify 1 tablespoon scoops of dough. I ordered 2, to replace Vollrath #70, only to find the size different. I contacted WEBstaurant chat to tell them and the rep told me the Vollrath #70 is .47 oz, but this one is .50oz. I was disappointed in the product and response. Thank you for your review! Since these scoops are different brands, the size varies slightly. We list the capacities of each scoop in our descriptions. If you prefer the Vollrath scoop, our item number is 92247403. This is a great little scooper. It's the perfect size for small cookies and for mini cupcakes and muffins. We could use about ten more! Perfect size for a mini cupcake however after two or three uses they already are broke. Pretty disappointed in the quality of the scooper and was hoping for something a bit more durable. Thank you for your review! If you are unhappy with your purchase, a Customer Solutions representative would be happy to help! These dishers are a great value, but if you are looking for a more durable alternative, try the Vollrath 47403 #70 squeeze disher portion scoop. 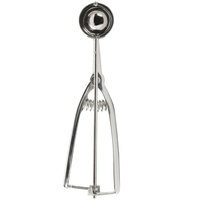 The #70 stainless steel disher is the perfect size for those bakers making a lot of cookies and need exact size. Can be used by either hand. Really sturdy, solid metal. Don't think this is going to break any time soon. Great for portioning dough for cookies. Surprisingly easy to clean too. A great scoop which helps keep the portion control in line for the kitchen. The springs on these are heavy duty and don't break as often as other disher scoops. A great size for sorbet. Highly recommended. I really like the small size of this scoop because it puts the perfect amount of dough on my mini pizzelle iron. I would highly recommend this scoop; it's a great price. This scoop is perfect for bakers. I use the #70 scoop when making cookies, resulting in uniform size and cooking. Much cheaper than purchasing a similar product from retail stores. This scoop has many great uses from baking cookies to serving batter into muffin pans.It works very well with ice cream and sorbets.This is a quality utensel that is made well. It also is dishwasher safe.One size is not enough to have, I have a nice collection of these scoopers in many sizes to serve all my needs. An Excellent small sized scooper! Great for controlling portions! Good for scooping chocolate ganache or making small cookies! Releases easily and is dishwasher safe! Wonderful Price!!! This is a very sturdy scoop. It fits perfectly in either hand. It is an easy and consitant way to scoop my cake truffle filling. It cleans up very easily. this is a fabulous size for scooping out cookie dough to make standard portions, or even making melon balls for your picnic fruit basket. I've been using these scoops for years, and love the high quality. very good scoop for semi-soft items such as butter, meat balls, etc. Unfortunately someone made the mistake of using this to scoop ice cream, and it became bent and unusable very quickly. THIS IS AN ALL METAL DISHER INCLUDING THE COGS SO YOU DONT HAVE TO WORRY ABOUT BROKEN PLASTIC TEETH LIKE SOME OTHER MODELS, MEASUREMENT IS ALSO ACCURATE. This is a great product. I use this size to scoop out cookie dough, and make evenly sized cookies. Of course it can be used for many others things. Don't waste your time with the cheaper versions at a grocery store or local discount store. This one will hold up for years after the cheaper versions break.